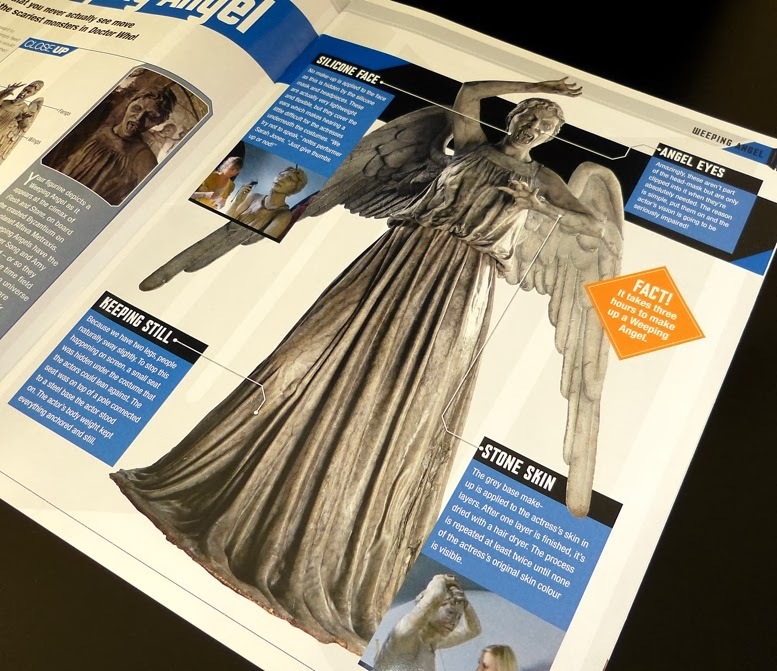 The fortnightly Doctor Who Figurine Collection includes a 20-page colour magazine, with the issue’s figurine packed in a neat box. In Issue 4, the figurine is our Weeping Angel, described as a Temporal Vampire, in ‘feral mode.’ The resin-cast figure stands some 81 mm (3.2 in) high, plus a base 8 mm (0.3 in) deep, for a total height of 89 mm (3.5 in). The series is made to 1:21 scale, so that means in ‘real life’ this Angel stands some 1.7 m (5 ft 7 in) so the species is not very tall. 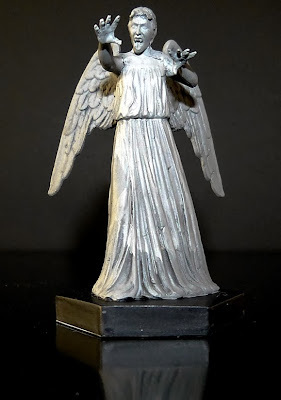 We’re not regular Doctor Who viewers, so don’t know too much about the Angels’ backstory, but suffice to say, they are one of the many nasty lifeforms confronted by our hero, the time-and-space travelling Doctor Who. 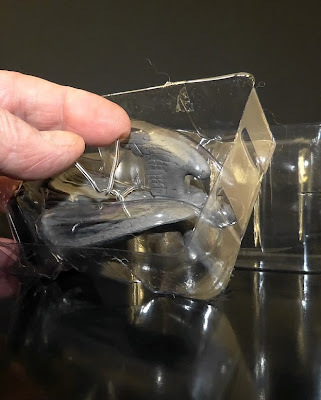 The figurine is neatly packed inside an acetate form-fit shell and a cardboard box. Be ready to take your time with unpacking, as getting inside that acetate shell is a slow job, which in our case needed careful work with a knife and scissors, followed by untwisting a plastic tie to finally release the figurine. No problem, but do take care, as you don’t want to break a wing. 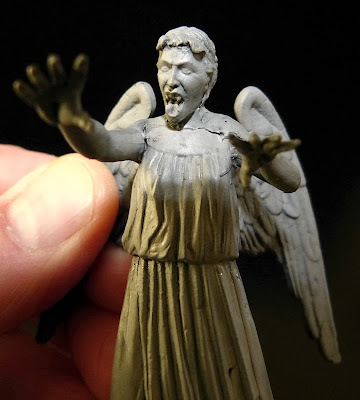 How does the figurine stack up as a model? 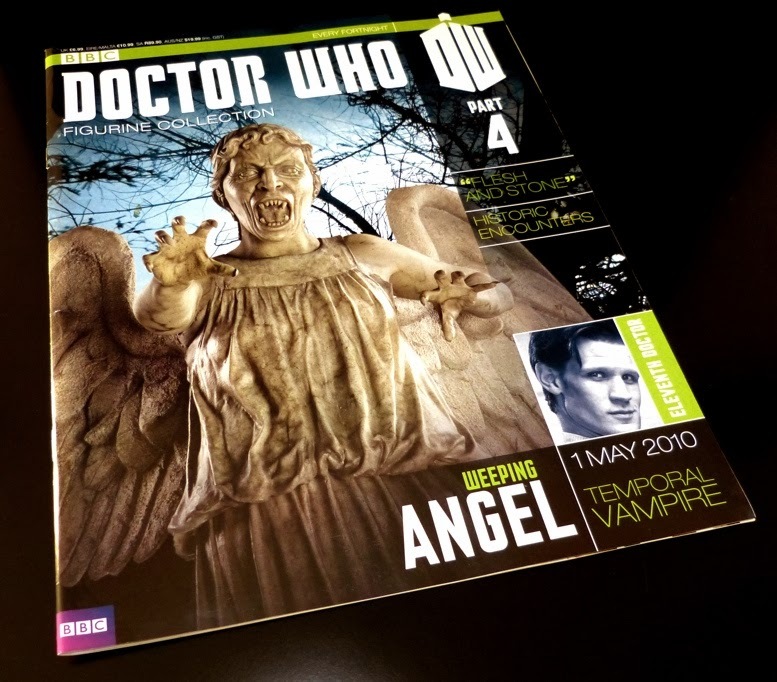 It’s well up to the standard of similar figures, so there’s nothing to complain about. This one comes in plain grey, but others in the series are hand-painted for a realistic look. The scale is perhaps an odd one for kit builders, as 1:21 isn’t to any standard format. 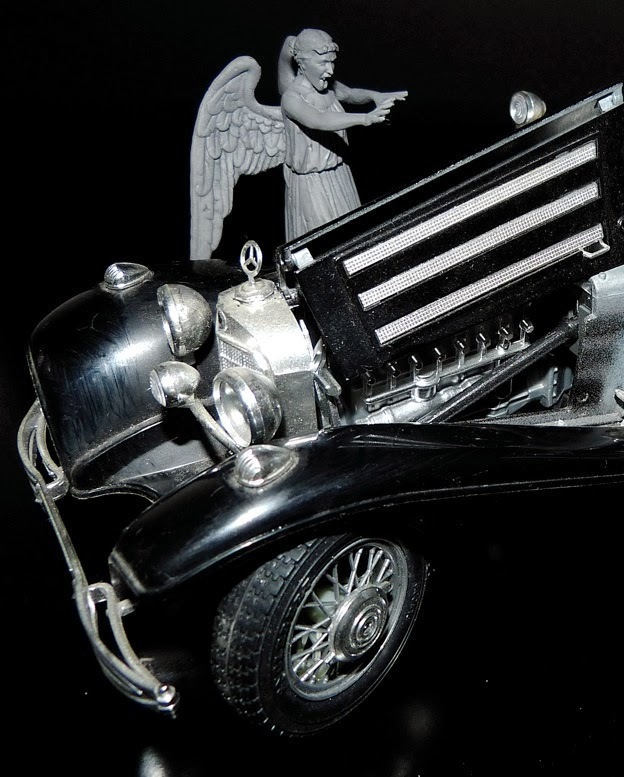 However, it’s reasonably close to 1:18, so our Angel is shown below putting a malign influence on a Bburago Mercedes-Benz. It isn’t too far out from a size point of view. 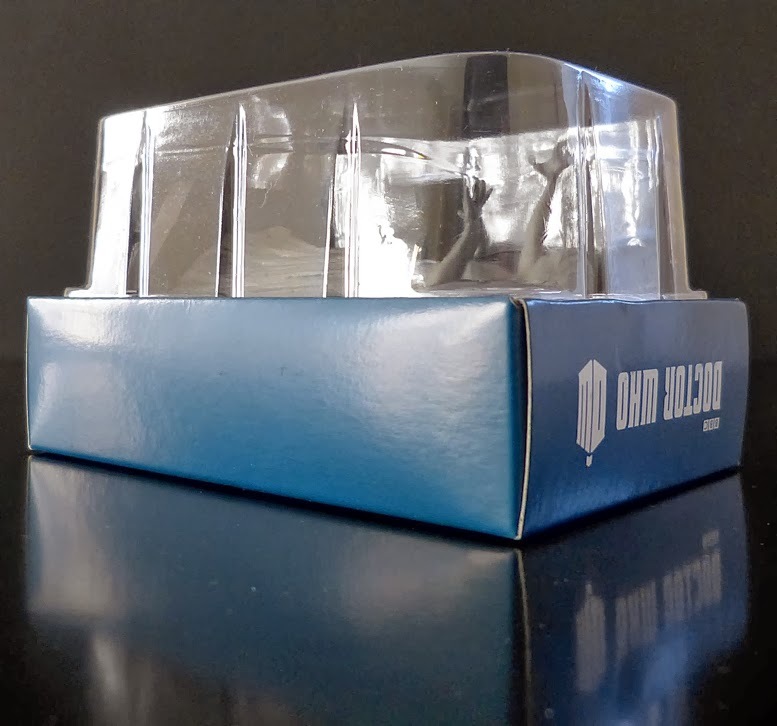 It’s perhaps a pity that the series is not to 1:24/25 scale, as that’s widely used in the kit industry, but again, with a bit of licence you could put any of these figures to good diorama use if you wish. 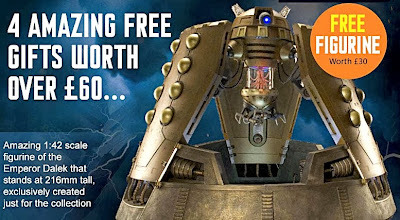 If you subscribe to the series, then Eaglemoss has a bunch of goodies for you, including a splendid Emperor Dalek, standing 216 mm (8.5 in) high. A great pity though, that the bulk precludes it matching the rest of the collection - in fact, it’s half-size, at 1:42 scale. 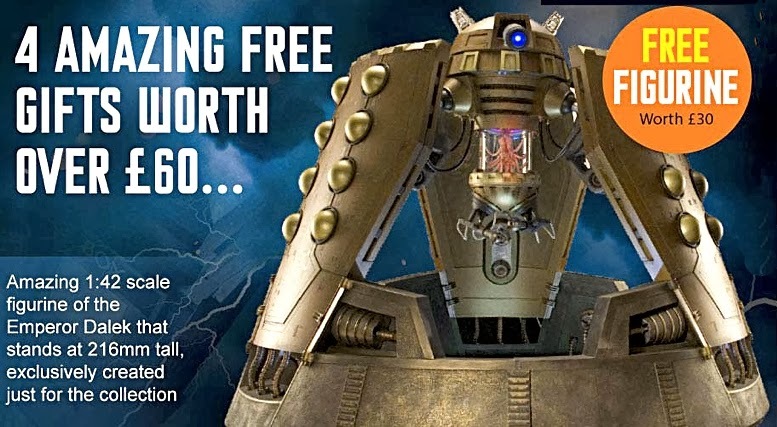 Dalek whinge apart, this is an interesting series for Doctor Who fans, and we’ll be looking at future releases with an aim to purchase some of the more unusual figures. 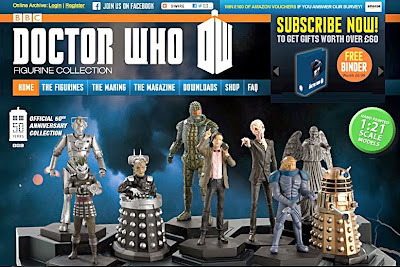 Plenty of information at the Eaglemoss Doctor Who Figurines site here. Other Doctor Who stuff here.